Drop-forged Chrome Vanadium steel sockets, hardened and heat treated with a fully polished mirror finish. S2 Steel hex bits with a blackened finish for resistance to corrosion. Bits feature no shoulder for easier access to recessed fixings. 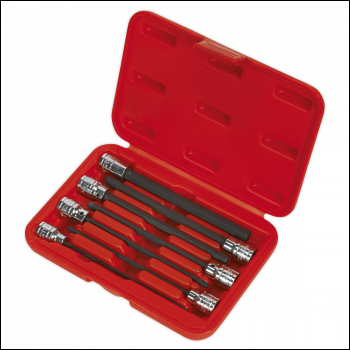 Sockets include 2mm hex setscrew allowing easy replacement of individual bits. Supplied in storage case. Drop-forged Chrome Vanadium steel sockets, hardened and heat treated with a fully polished mirror finish. 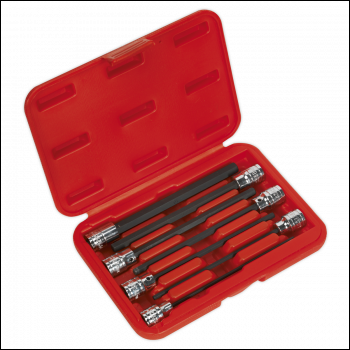 S2 Steel hex bits with a blackened finish for resistance to corrosion. Bits feature no shoulder for easier access to recessed fixings. 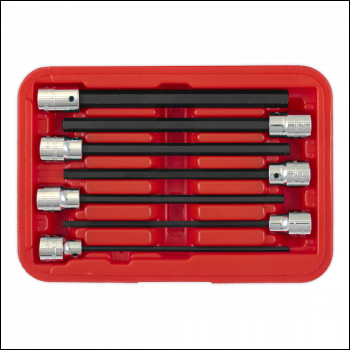 Sockets include 2mm hex setscrew allowing easy replacement of individual bits. Contents: 3, 4, 5, 6, 7, 8, 10mm.